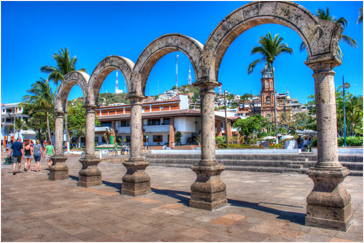 Puerto Vallarta, once a small fishing village nestled between the Pacific Ocean and the Sierra Madre Mountains has experienced a huge development since its foundation in 1918. Today, the combination of the typical Mexican town with its cobblestone streets and red tiled roofs and the modern infrastructure, excellent shopping opportunities and a large variety of activities all around the area attracts more tourists every year. This charming city and most diverse beach destination has become a world class resort. Now, Puerto Vallarta is divided by sections such as Centro (downtown), Viejo Vallarta (old Vallarta and area of the very original village), hotel zone (from airport to begin Sheraton), Marina Vallarta (a new development with its own yacht pier, condos and hotels, located just before the airport). Puerto Vallarta is well known for its excellent gastronomy. You will find a large variety of restaurants with exquisite cuisines of different nationalities.